Thanks to the iPhone and iPod Touch you need never be away from the mass re-killing of hordes of shuffling, reanimated Nazi soldiers. 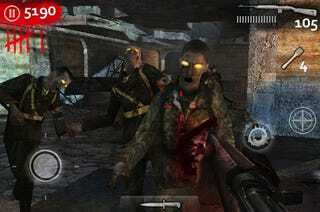 Call of Duty: World At War: Zombies has been released via the iTunes App Store today. Call of Duty: World At War: Zombies consists, according to the official description, entirely of the 'Nacht der Untoten' map that Call of Duty: World At War fans are likely familiar with. For an asking price of $9.99 USD, that may be asking a lot. We'll be testing it out shortly to see how much content one gets for ten bucks. In addition to single player Nazi zombie extermination, the iPhone version supports four players via Wi-fi and two players via Bluetooth connection, promising a "silky smooth 3D environment" in which to gun down rotting Nazi officers. Achievements, leaderboard support and downloadable content in the form of new maps are all promised.